I arrived in Japan in September 2006, at a time when the TEFL ‘party’ had apparently already ended. Notwithstanding such claims, I am now approaching my sixth year teaching English in Japan, and my personal and professional experiences belie suggestions that Japan is no longer amongst the most stalwart of ELT destinations. It’s true that the financial benefits English teachers in Japan have been able to demand have decreased consistently over the past twenty years, particularly following the burst of the bubble economy in the 1990s and the Great Recession in the late-2000s. Few companies will now cover the full cost of your airfare to Japan, and contract bonuses are rare. Neither has the situation been helped by the collapse of English language teaching chain schools Nova in October 2007, and Geos in April 2010, which contributed to a glut of English teachers in Japan. This state of affairs, along with the continuing recession, lead to lower teacher turnover, as teachers faced the prospect of not being able to find other (better) jobs either in Japan or their home countries. It hasn’t all been an unrelenting decline, however. The strength of the yen against the pound has risen dramatically over the last five years, which, although bad news for Japanese exports and those visiting Japan, is good news for expats sending money home. In September 2006, £1 cost ¥221. In August 2011, this price has dropped to ¥127, effectively increasing the relative value of a Japanese salary by 80%. Furthermore, a recently introduced law stipulating compulsory English lessons for elementary school children, along with a significant number of native English teachers leaving Japan (although it seems the majority of those who left were expatriates from other Asian countries) after the 2011 earthquake and tsunami has to some extent reset the balance between the supply of and demand for English teachers in Japan. There have also been suggestions (here and here, for example) that now, more than ever, Japan needs English language skills, although we should perhaps reserve some skepticism for both individuals and organizations who attempt to convey the notion that English language teaching in a post-tsunami Japan is some kind of heroic deed (unlike the deeds of those directly involved in the relief effort). About two weeks after the earthquake and tsunami, a friend who had left Japan before the disaster asked me whether she should come back in order to take up an offer to work for Westgate (one of the few companies who do provide airfare). The official line of the British Foreign Office is that they’re advising against all unessential travel to the north east of Japan and Tokyo… in Kanagawa we’ve had a blackout roughly every other day since the earthquake, but only for two or three hours a day – enough to make your life inconvenient, but not in any way dangerous. 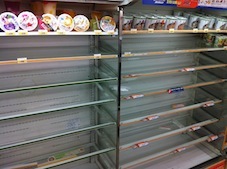 Food shortages are still a problem in some parts of Japan – particularly milk and bread. However, my local supermarket was back in stock for both of these items today, and the supply chain seems to be slowly getting back to normal… As for radiation, again, the official line is that outside an 80km radius from the power plants, the increased levels of radiation being detected are no risk to human health. TEPCO seem to slowly be making progress with the leaking reactors, although they say it could take weeks or months to repair completely. Five months on, and the situation is much improved – at least in areas not directly affected by the tsunami. 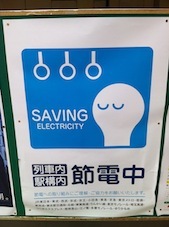 The supply chain is back to normal, and despite the ongoing ‘setsuden’ (electricity saving measures) most of the infrastructure in Tokyo and immediately surrounding regions is operating at near full capacity (it will be a long time before the same can be said of some areas in North East Japan). Although radiation worries are always there in the background, people are generally getting on with their lives, whilst trying to take all reasonable steps to limit their exposure to harm. Japan is still – and will always be – an incredible country in which to live and work. Although the availability and financial reward of English teaching work is not what it once was, there are still plenty of rewards – financial, cultural, personal, and emotional – to be had by those thinking of teaching English in Japan. In fact, the real question is not what you can take from the experience, but what you can give back.